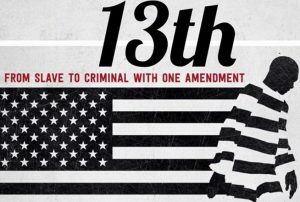 13th refers to the 13th Amendment to the Constitution, which reads “Neither slavery nor involuntary servitude. . . shall exist within the United States.” The progression from that second qualifying clause to the horrors of mass criminalization and the sprawling American prison industry is laid out by DuVernay with bracing lucidity, with a potent mixture of archival footage and testimony from activists, politicians, historians, and formerly incarcerated women and men. Presented by Woodinville Meaningful Movies.